These stairs in the modern section of the Daniels building lead up to the graduate studio on the top floor and the high steps serve as a display area and also as seating for temporary sessions. 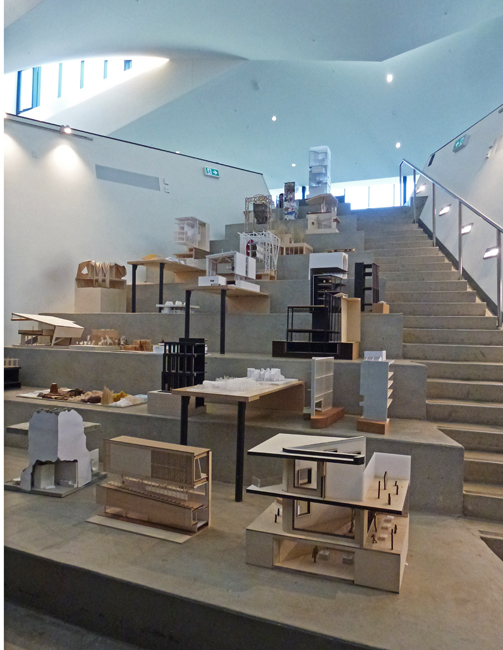 During the Doors Open event they had set up a lot of displays of models the architecture students had made during the year. First, I love those stairs. Secondly, what a great use of space. Thirdly, these models look most interesting and would be a delight to see up close and personal. Nice shot, too, Pat! ...an interesting use of a flight of stairs. Hello, the stairs are a neat way to display the models. Happy Thursday, Enjoy your day! I'd find those models interesting to look at. Ha exposition stairs. Nice thought out. That would be fun to walk up the steps beside the display to see each model close up! Neat! My son goes to a brand new school and they have this exact set up in the school, regular stairs and then they use the bigger steps for the kids to sit on for assemblies etc. Of course we want to see what's up the stairs, P! Goodness what fun! As a little girl I'd take them all and make doll houses and rooms out every single one of these! It is a fine space. The displays fit nicely there.